Exophthalmometry is a method for measuring globe (eye) position for a patient. The general idea is to measure the globe position to determine whether or not globe malposition is present. Globe position is typically measured clinically using a Hertel exophthalmometer device which measures the distance from the lateral orbital rim to the corneal apex. This distance provides a metric for forward globe displacement. Hertel exophthalmometer measurements are reliable for normal patients, but can be problematic when used on patients having orbital rim fractures because the device bases its measurements from the orbital rim. Thus, patient’s having displaced or missing lateral orbital rims, such as in zygoma fractures, cannot be accurately assessed. Furthermore, it can be difficult to steady the device on the patient clinically and relies on the clinician to visually align the device to the corneal apex in order to obtain a measurement. This introduces some variation in measurements. What is CT based exophthalmometry? It is possible, however, to still measure globe position accurately on patients having orbital rim injuries. A CT scan of these patients can be used to accurately measure globe position relative to patient-specific reference planes. Frankfurt, sagittal, and frontal (coronal) planes can be identified within the CT scan and used for referencing globe position as shown below. 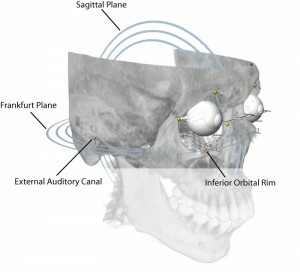 The Frankfurt plane is constructed from four anatomic landmark points: left/right external auditory canal and left/right inferior orbital rim points. We define the sagittal plane as the plane perpendicular to the Frankfurt plane that passes through the centroid of the four points that define the Frankfurt plane. Furthermore, we define a frontal (coronal) plane as perpendicular to both the patient-specific Frankfurt and sagittal planes. We can then measure globe position relative to these planes by measuring the distance from the globe center to each plane. CT based Exophthalmometry can be performed using the Stratovan Maxillo software. Maxillo loads the patient CT scan and provides tools for placing anatomic landmark points to define the Frankfurt, sagittal, and frontal planes as well as identifying globe centers. The globe position relative to these planes is then automatically computed and can be exported in a report as shown below. Globe position is measured relative to Frankfurt and frontal planes. For what can exophthalmometry be used? Exophthalmometry can be used to assess a variety of injuries for surgical indication, to evaluate enophthalmos, exophthalmos, and Graves’ disease. Unilateral fractures can, for example, be assessed by comparing the globe position on the injured side to that on the uninjured side. Lam AK, Lam CF, Leung WK, Hung PK. “Intra-observer and inter-observer variation of Hertel exophthalmometry“, Ophthalmic Physiol Opt. 2009 Jul;29(4):472-6. Nkenke E, Benz M, Maier T, Wiltfang J, Holbach LM, Kramer M, Häusler G, Neukam FW. “Relative en- and exophthalmometry in zygomatic fractures comparing optical non-contact, non-ionizing 3D imaging to the Hertel instrument and computed tomography“, J Craniomaxillofac Surg. 2003 Dec;31(6):362-8. Yeatts RP, van Rens E, Taylor CL. “Measurement of globe position in complex orbital fractures. I. A modification of Hertel’s exophthalmometer, using the external auditory canal as a reference point“, Ophthal Plast Reconstr Surg. 1992;8(2):114-8.